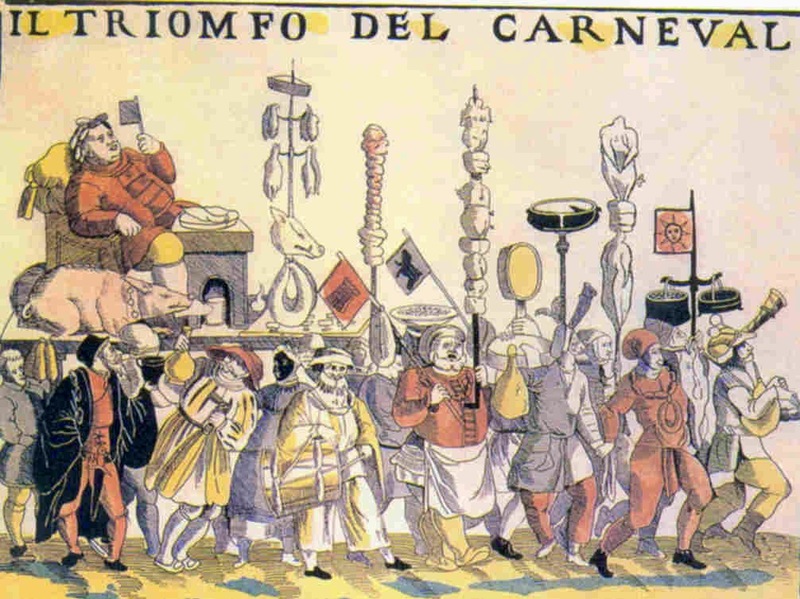 A CARNEVALE, OGNI CARNE VALE! No one knows who said it first. It's an old Italian proverb. During Carnival, all kinds of meat are permitted. During Carnival, any kind of meat will do. During Carnival, all meat tastes good. you might as well give up! 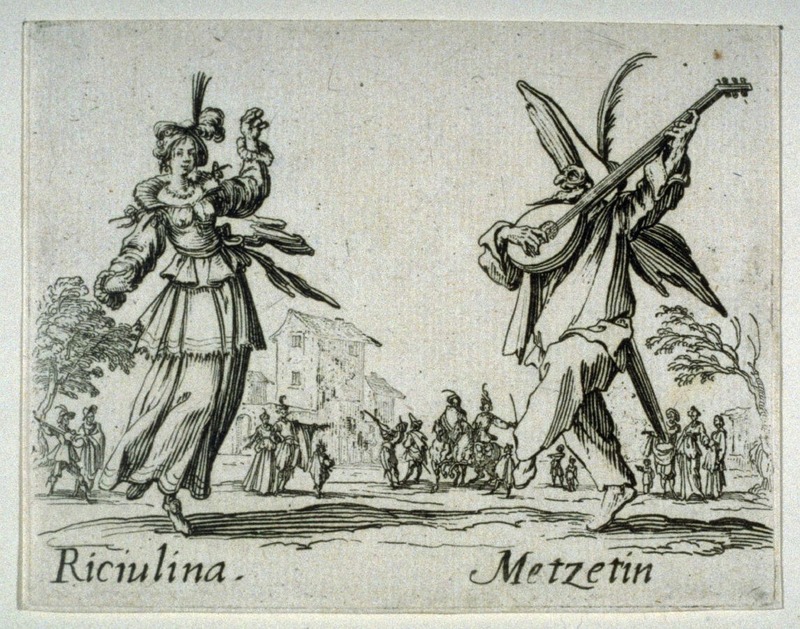 During Carnival, excess of every kind was indulged - or at least, laughed at as a good joke. Food was foremost in everyone's mind before the protracted fast of Lent - in a society where few had enough to eat, even at the best of times. 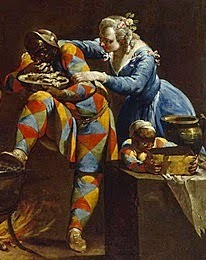 Arlecchino (or Harlequin) - the food-obsessed servant - was the chief representative of the starving classes in the Commedia dell'Arte. His feral appetite raised many of the biggest laughs and his hunger-induced deceptions propelled much of the action. 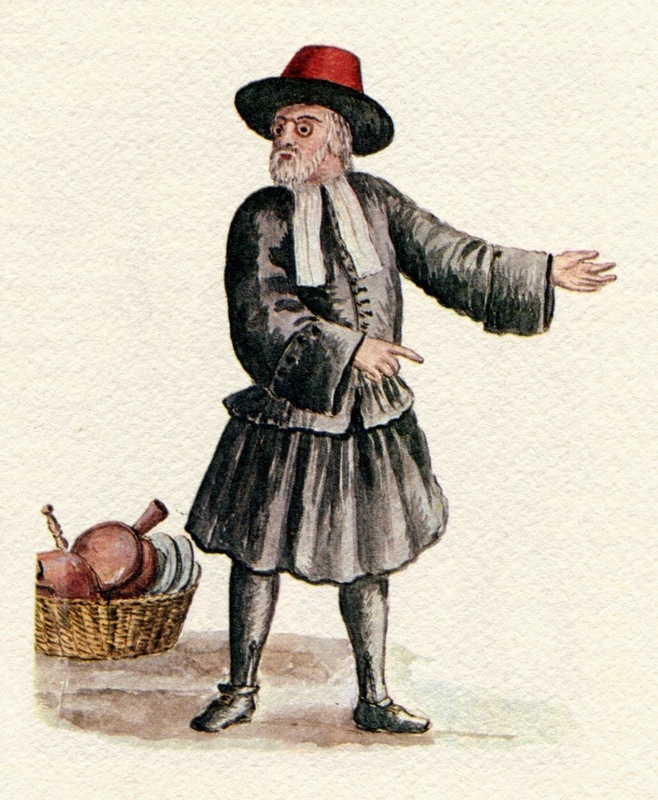 Riha - Messer Alamanno's gluttonous manservant - plays this role to the hilt in L'Ebreo / The Jew. sette volte il dì, e sequeste nonbastino quattordici." Riha: Oh, I didn't leave Skinny Valley, my home town, in order to live in someone else's house in Florence and earn a mere seven lire a month. Oh no! I came here to eat seven times a day. Fourteen, if seven is not enough. During Carnival, human appetites rose to the surface and took on a reckless life of their own, even among those who were not usually starving. And in public, the hankering for food could indicate other cravings that were less comfortably expressed - especially on stage. Carnival was the time when amorous ventures came to fruition - both in fact and fantasy. Marriages were celebrated, with all the joyous license of the season. And masked revelers made the most of their holiday disguises - consummating relations of every sort. Welcome to Carnival in Florence! And welcome to Michelangelo Buonarroti the Younger's comedy L'Ebreo / The Jew! But where do Jews fit into this kaleidoscopic picture? 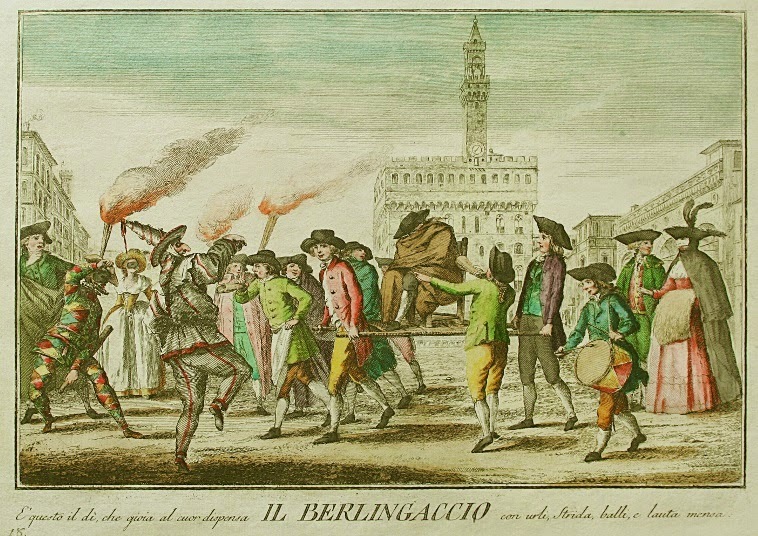 They were supporting players in the Florentine Carnival, typically relegated to the edge of the scene. Most denizens of the Florentine Ghetto earned meager livings in the second-hand trade, refurbishing and reselling used clothing. Some developed a profitable sideline - renting out costumes for festive and theatrical events. For Jewish second-handers, Carnival brought a rush of business - since many of the Christians frolicking in the streets found their holiday gear in Ghetto shops. In L'Ebreo, Michelangelo's most effective bit of theatrical business involves Ambrogio (the pompous lawyer) disguising himself as a Levantine Jew (a rich merchant from Turkish lands). Eventually - after many twists and turns of the plot - he hopes to win the hand of Oretta (the beautiful - and utterly improbable - young woman he loves). At first, Federico (the wily Christian marriage broker suggests that he and Ambrogio find someone to impersonate a Hebrew Turk. What - he asks - could possibly be easier during Carnival? 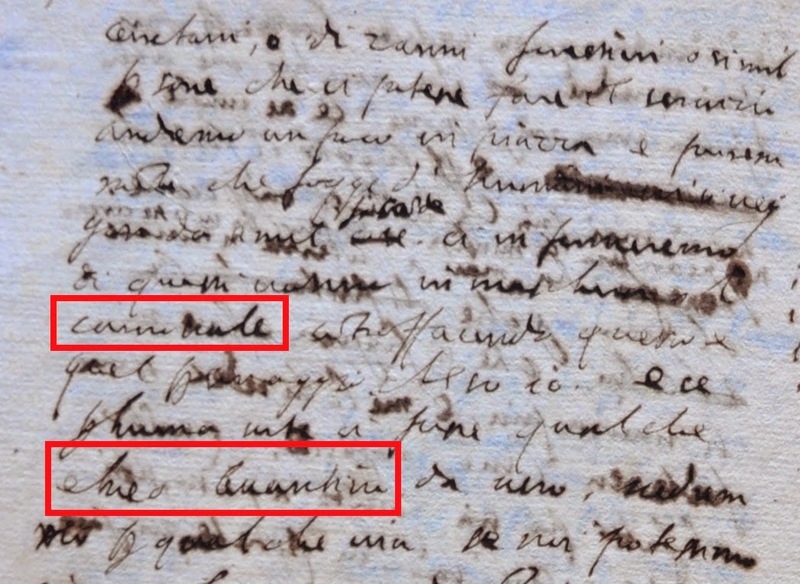 qualche via se noi potessimo ricever il servizio da lui. Federigo: Oh, no! It's not as if Florence wasn't full of people who are more like Jews than Christians! Let's give this some thought... I want to try those hole-in-the-wall taverns in Messer Bivigliano's Alley where all the foreign charlatans and hucksters and buskers hang out. But wait! This is Carnival! Just walk out the door and we’ll trip over masqueraders of every size, shape and color imitating everyone you can think of. We might even stumble on a real Levantine Jew! Wouldn’t that be nice? But then, Federigo takes the joke one step further. Ambrogio needs to play the Levantine Jew himself. rifaresti d’un criniere, cioè volsi dire d’un turbante. Federigo: Well… You’re put together in just the right way. 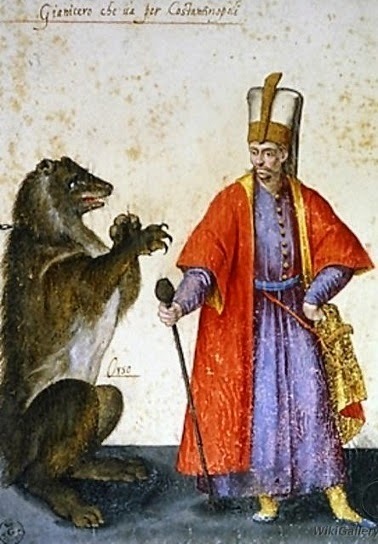 And when it comes to lumbering around in a long robe, you’ve had plenty of practice as a lawyer. Just pop something on your head… A turban! I see a turban! Then comes the best joke of all. One that would have thrown any Florentine audience into fits of laughter - especially during Carnival. 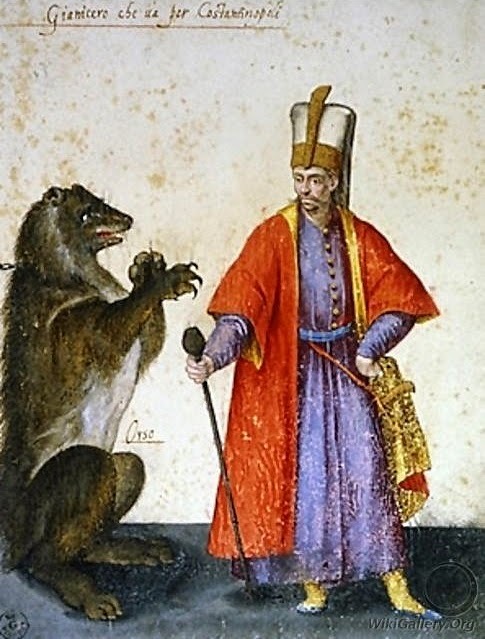 Just like them, Ambrogio rented his exotic costume from a Ghetto Jew. Amb: Ma donde avessimo l’habito? appreso tutti gli abiti, barbe e cio che bisognerà. Ambrogio: But where did we get this outfit? Federigo: The whole rig is from Melchisedec. Those Jews have all the clothing, all the beards and all the other stuff you could possibly want, right there in stock. 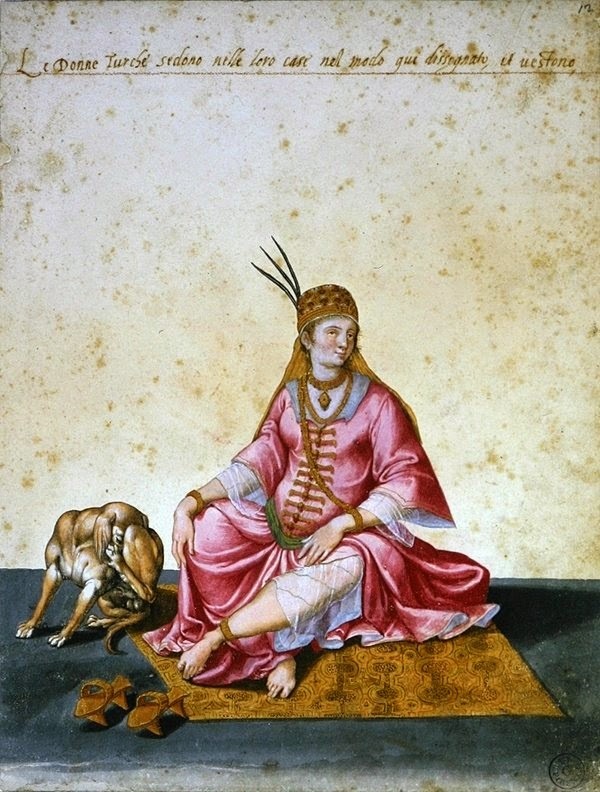 A Janissary and a Turkish Lady at Home (J. Ligozzi, Florence, circa 1600). 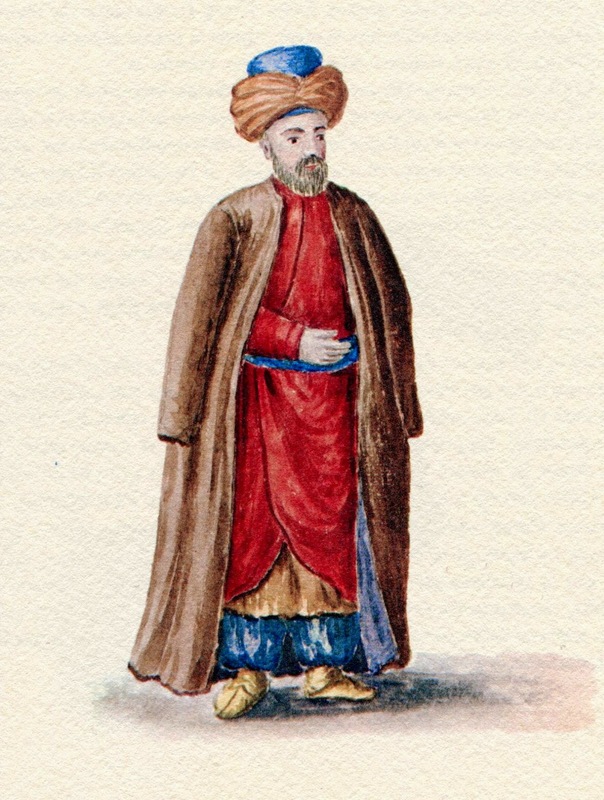 Turkish fancy dress was always a hit among holiday revelers - especially in the early years of the seventeenth century. And Turkish themes dominated the ballets, masques and other entertainments at the Medici Court. 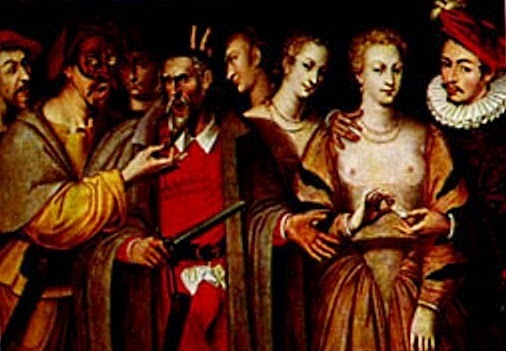 But Ambrogio's outfit - turban, beard and all - would have triggered a special shock of recognition during the Carnival of 1614. Who was Melchisedec - the Levantine Jewish Merchant - in historical fact? And who was he in the minds of the Florentine public?